You have a clear vision for your growth, but is the business ready? Various factors play a role in determining growth readiness i.e. your ability to attract capital, enter new markets, change your business model and keep your staff motivated. This presentation will showcase some of these growth factors and use case studies to suggest steps you can take to ensure your business is ready for growth. 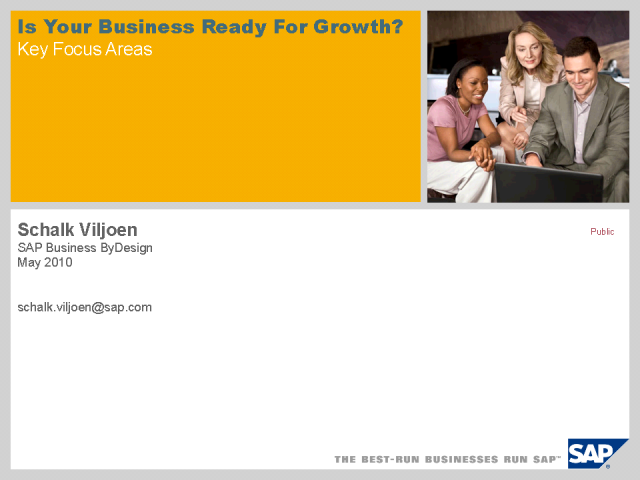 Schalk’s focus area at SAP is business development for Business ByDesign, SAP’s On Demand solution for Small Businesses and Midsized Companies. Schalk has 20 years experience in the IT industry, ranging from technical support to sales to product marketing. The various industry perspectives gained as customer, vendor and channel has helped shape his passion and belief in Cloud Computing in general and SaaS in particular. Title: Is Your Business Ready For Growth?